1. Sand any rough edges and clean sanding dust off the tray. 2. This project is about painting in layers. Using a foam brush, apply 2 coats of cream wash (1 part paint and 1 part water) to the top surface of the platter and let dry. 3. 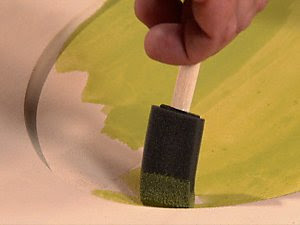 Next, apply a coat of spring green wash to the inner base of the platter and let dry. Apply a coat of butter yellow wash to the inner base of the plank and let dry. Apply a coat of robin’s egg blue wash to the inner base of the plank and let dry. Apply a coat of dark brown wash to the inner base and let dry. 4. 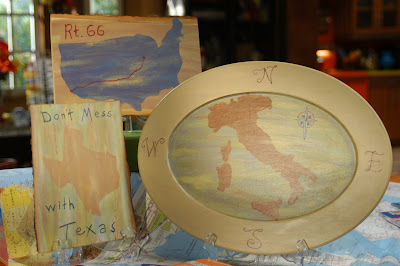 Cut out the map and position it in the center of the painted platter. Lightly secure the map to the platter with low-tack tape. Trace around the map with a pencil. Pull up the map to reveal the country outline. 5. 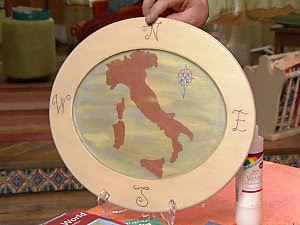 Using a small round paintbrush, fill in the map outline with tan paint (not wash) and let it dry. Let the platter dry thoroughly before sanding. 6. Using 60-grit sandpaper, sand the entire platter. Sand lightly on some areas of the platter and more heavily in other areas to expose different layers of paint. Smooth out sanding lines with 120-grit sandpaper; wipe the surace with a rag to remove sanding dust. 7. Optional: add extra embellishments such as map symbols or sayings to the platter. 8. 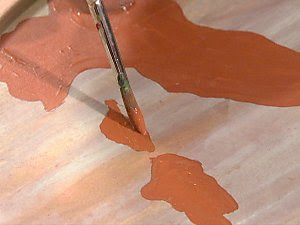 Using a foam brush, coat the platter with matte-finish clear sealer. 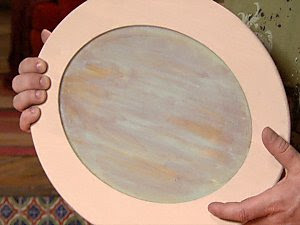 Secure a picture hanger to the back of the platter for hanging.